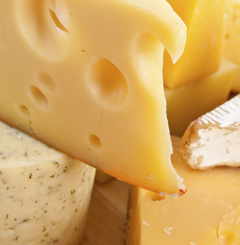 Many cheeses made in Switzerland are considered Swiss mountain cheeses. Generally large, firm, well-aged, full-flavored - and often sprinkled with holes. They reflect all that is wonderful about Swiss artisanal cheesemaking: use of raw cow's milk, careful attention to every detail of production, proper aging and the importance of quality over quantity. A.O.C. Appenzeller is an ancient, Swiss mountain cheese which some say may date back to the days of Charlemagne. 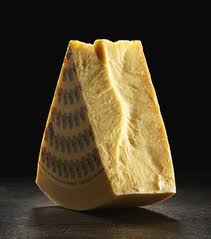 In fact the cheese was used as currency in the 8th and 9th century. Classic Appenzeller is ripened for 3-4 months; Surchoix Appenzeller is ripened for 4-6 months and Extra Appenzeller is ripened for a minimum of 6 months. If you can find the true artisan, raw milk version, by all means buy it - and avoid the foil-wrapped versions which are so common. One great name to look for in Appenzeller cheese is Alois Pfister; his cheeses are selected and ripened by the one and only, world-famous Rolf Beeler - the top name in cheese selection and affinage. You will find the Rolf Beeler name on the cheeses he selects from local cheesemakers and ages until perfection. 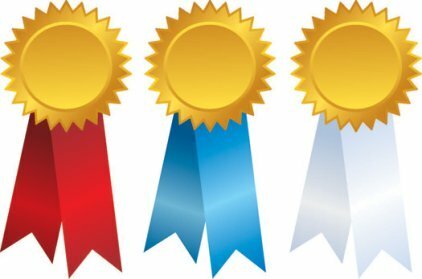 What can you expect from a top-quality Appenzeller? Like most Swiss mountain cheeses, Appenzeller can vary from flowery to spicy and tangy (the older versions). Tangy flavor is a characteristic of a washed-rind cheese. There is a good balance between sweet and salty. It has a dense, firm but smooth texture. Overall a delicious taste experience. A.O.C. Emmentaler is probably the best known of Swiss mountain cheeses - its name is virtually a synonym for the 2 word phrase Swiss cheese. Produced in huge, tractor-size wheels weighing 175 - 220 lbs., the cheese of course has numerous holes scattered throughout. Bacteria in the cheese form pockets of carbon dioxide which expand during the ripening process, thus causing holes which vary in size from tiny to even golf ball size. 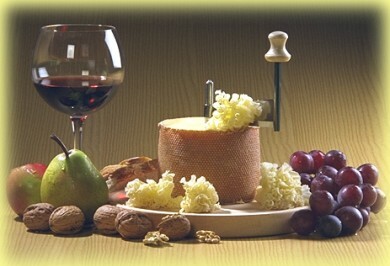 Swiss cheesemakers are fond of quoting ..."Anyone can make the holes, but only the Swiss can make the cheese". Emmentaler actually has less fat than other Swiss mountain cheeses because the cheesemakers skim the fat from some of the raw milk used. Two milkings (evening and the next morning) are used to make the cheese. But less fat does not mean less flavor. This is a big flavor, Swiss mountain cheese, buttery, fruity and nutty. Cheese produced for export will be stamped with the trademark symbol of the Switzerland Cheese Union. Avoid any Emmentaler which shows no rind. The rind is beige to dark brown in color, the paste will be pale yellow, with eyes throughout. It is low in salt as well as fat, since no salt is added to the curds during production. All Emmentaler which deserves the name is considered "perfect" in quality, due to the extremely rigorous, hygienic standards maintained during production. It is aged for a minimum of four months in cellars/caves and you can purchase cheese which has been aged for 12+ months, which will have even more flavor. See our separate Gruyere Swiss Mountain Cheese page. A.O.C. Tête de Moine (aka Bellelay) was first produced in 1192, in the former monastery Bellelay in the Swiss Jura Mountains. The name literally means "monk's head" and the historical derivation may come from the tax that the farmers had to pay to the abbey - one cheese for each monk. It is also said that the name refers to the appearance of the cheese when it is served in the traditional way - with the top sliced off and the the top of the cheese scraped away in very thin layers, which serves to heighten both the aroma of the cheese and its taste on the palate. When so served, the top of the cheese reveals the light paste while the sides of the rind remain brown ... thus bringing to mind the appearance of a monk's head with the crown shaved. The cheese then slips off the blade in paper-thin, curly-cued rosettes which are wonderful decorations for any platter, or just wonderful to pop into the mouth for a taste treat. A special tool called a Girolle was developed specifically to use when serving Tête de Moine. You should never slice a Tête de Moine ... always shave it, If you don't have a Girolle, use a vegetable peeler. See the photograph showing the cheese with a Girolle attached. The cheese is made from raw cow's milk that have not been fed silage. The rind will be firm, brown to reddish in color; the paste will be ivory to bright yellow. The paste color will depend upon the season and the richness of the milk. Cows grazing in the high mountains during summer when pasturage is at its lushest and the terroir in full bloom, so to speak, will produce richer milk with higher levels of butterfat, thus producing a more yellow cheese paste. Typical of Swiss mountain cheeses, Tête de Moine is a washed-rind cheese and so it receives regular brine washing during the aging period of 4 to 6 months. Unlike the Swiss Mountain cheeses discussed above .... Hoch Ybrig is a newcomer to the gourmet cheese scene. It was created in the 1980s and is made today in only one dairy. Rolf Beeler selects the best cheeses from that dairy and then matures them to proper ripeness - usually 8 months of aging is just right. At 9 months or so the cheese will have a buttery consistency; as it ages further it will acquire some of the crystalline qualities that Gruyère is known for. The raw milk for Hoch Ybrig comes from Simmental cows. It is carefully processed into 16 lb. firm, washed-rind cheeses. The brine for the washing is white wine ... which contributes to the overall sweet finish of the cheese. The rind will be thin and dark reddish-gold with a light dusting of white mold. The interior paste will be ivory to pale gold, sometimes with a few eyes. The texture is dense, supple and the flavor blends fruit, nuts and toffee to an almost butterscotch conclusion. When experts describe a cheese as "sublime and mouthwatering" you know that it must be a winner - especially when it is such a small production, hand-crafted artisan cheese like Hoch Ybrig, that is then aged under the experienced hands of Master Affineur Rolf Beeler. Give it a try - you are sure to love it! A.O.C. Sbrinz is another small production cheese, produced in just 30 small dairies from the raw milk of Brown Swiss cattle. Among Swiss mountain cheeses, Sbrinz is thought to be Switzerland's oldest cheese, dating back to the days of Pliny the Elder in the first century C.E.. It was he who referred to Sbrinz as Caseus helveticus (Swiss cheese). In fact it may be that Parmigiano-Reggiano and Grana Padano cheeses in Italy were modeled after Sbrinz. With such a long history, it is understandable that this cheese is a source of great pride among the Swiss. 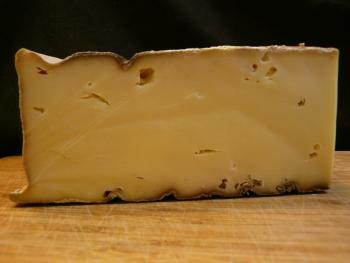 Sbrinz is a washed-rind, raw cow's milk cheese, formed into wheels of 88 lbs. Production requires both pressing and cooking of the curds. The cheese is made into wheels of 80 lbs and then aged for periods ranging from 30 months up to 4+ years. When they are aging, the wheels are stored vertically, rather than horizontally. The hard rind will be a blue-grey with a light white dusting of mold. The paste is pure white with a strong, nutty and spicey flavor. It is a hard textured, grainy cheese that lends itself very well to grating. Try this Swiss mountain cheese as an alternative to whichever hard grating cheese you typically choose. Two other similar Swiss mountain cheeses are Spalen and Saanen. 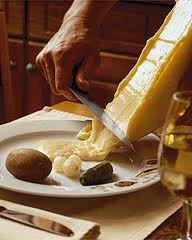 There are 4 cheeses known as Raclette cheeses: Bagnes, Orsières, Conches and Gomser. All have the A.O.C. designation. The 4 different names refer to the location of the cheesemaking dairies. You will find that the name of the village nearest to where the cheese is made ... will be molded into the edge of the cheese's rind. Entertain Like No One Else With an Authentic Raclette Warmer! This set includes a raclette cheese holder, sturdy base and quartz light mechanism for melting cheese. 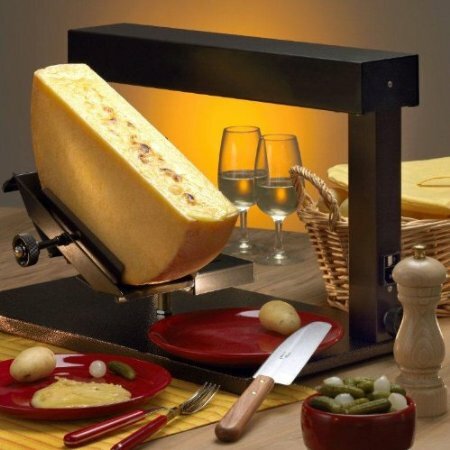 The cheese holder swivels and slants downward, to scrape melted cheese, and accommodates either a half round or half square of raclette cheese. Click on the link to order one today! - G.C.D. Stanser Fladä is an unforgettable, stinky cheese of the washed-rind type. Its aroma and flavor (mellow but pungent) may be overpowering for many, but for some cheese lovers it is an irresistible cheese. Époisses de Bourgogne. When you open the box you will find a moist, reddish-brown rind. Inside the paste will be off-white to pale yellow. The name of the cheesemaker who created this magnificent cheese is a name to remember ... Josef Barmettler. This is a superior cheese in the washed-rind category, but it certainly is not for everyone. Swiss mountain cheeses dating back over 1,000 years. Today there are just a few local artisanal cheesemakers who still make Vacherin Fribourgeois with raw milk from Fribourgeois cattle. The Fribourgeois breed of cow is another name for Holsteins. Rolf Beeler selects and ages these cheeses so you know to look for his name on the cheese when you buy it. It has a thick, tough, ugly-looking wavy rind - brownish-grey in color, with an underlying cross-hatch pattern. The paste is firm, but softer than say a Gruyère. Vacherin Fribourgeois reflects its Swiss terroir with aromas and flavors of grass, hay and nuts. During production, the rind is washed and turned many times - this is not an easy cheese to make and requires painstaking care by the cheesemaker. Today its an endangered species, so if you find it, you owe it to yourself to buy it. You should be able to find virtually all of these Swiss mountain cheeses at a reputable cheese shop. But they can also be ordered through some really excellent online sources for convenient and fast home delivery. I have ordered many times from Artisanal Cheese in NYC and am always thrilled with the quality of the cheeses AND the excellent service. It's worth a visit to their website to browse through their huge selection of both domestic and imported handcrafted, artisanal cheeses.